Here’s a sobering fact: a round-trip flight from San Francisco to New York generates one-sixth the carbon emissions that the average person creates in a year. In other words, giant jet engines are huge culprits in worsening climate change, doing their work quickly. That’s where electric aircraft present a potential ray of hope. They go far beyond tinkering with fuel efficiency or trying to use biofuels as solutions to the sprawling carbon footprint of traditional air flight. The most common power for electric aircraft is the battery. Most of these batteries are lithium-based, usually mixed with various metals. The challenge is to create batteries large enough for hours of power that will still allow for flight. This is one of the major issues facing engineers. Fuel cells are other common power sources for electric planes. These create power from hydrogen and water and have longer lives during use than batteries. Solar cells are also being developed, but are still low-output. In 2018, electric aircrafts are new and developing, and have captured a lot of attention. As was the case with the Wright Brothers’ original flight out of Kitty Hawk, flights of electric or electric-hybrid aircraft have been brief and experimental. So far there haven’t been any passenger flights with these new airplanes, but that is the goal for the next several years. Similarly, Airbus has a creation called CityAirbus, which lifts straight up, like a helicopter, and is meant to transport people around urban spaces. Zunum Aero, a Seattle startup, is trying to develop an electric plane that looks more like a traditional small passenger plane designed to fly 700 miles with 12 passengers. This craft is hybrid, rather than full electric. Predictions vary as to when to expect commercial electric planes. MagniX, one industry participant, suggests there will be commercial electric flights of up to 500 miles by 2022 and up to 1,000 miles by 2024. The average U.S. domestic flight averages 800 miles. How will electric planes be used? As discussed, because of the difficulty of flying on electricity for great distances and great periods of time, long passenger flights with hybrid or fully electric craft are pegged for several years from now. In the shorter term (and longer term too) many makers of these crafts are envisioning a different way of traveling around urban areas. The companies usually have specific ideas about market niches for their products, as well as ways of taking off and landing. 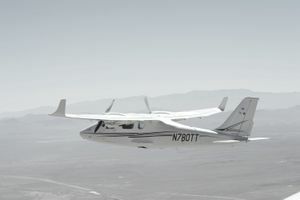 One factor that makes electric airplanes possible is that there are many small, local airports that don’t have passenger flights leaving from them, and these are good places for electric craft flying short distances. It gets a bit more futuristic than that. Some makers of electric craft plan for their planes to land and take off atop buildings, like helicopters. With the possibility of takeoffs from the ground in urban areas, some companies are interested in something like urban air taxi services. One way to define the impact of electric planes on the environment is to say the negative effects are zero. There is no need for the burning of fossil fuels of any kind. Thus, the use of electric planes will cut down carbon emissions, though there’s no way to predict how much without clearer estimates of usage. And there is more to the sustainability conversation than just carbon emissions. Jet planes also emit water vapor emissions that turn into long plumes of exhaust—these are called contrails, and they worsen climate change by trapping heat inside the atmosphere. This is a great way in which electric planes are beneficial. While the potential benefits of electric airplanes seem compelling, it will be several years before electronic planes replace the use of traditional passenger planes, particularly for cross-continental or international flights. The technology for long-distance electric flights is still very much in its infancy. As for the cost of flights that may occur in the not-so-distant future, The Washington Post states that Zunum Aero aims for $25 tickets for flights of short distances such as Miami to Tampa. Given that fuel accounts for 30% to 50% of an airline's operating costs, a successful shift to electric should eventually translate into lower fares.